Last week, on a clear and sunny afternoon, I traveled south approximately 50 minutes to the nearby Temecula Valley (TV) winegrowing region where I met up with my friend of the vine, Linda Kissam. I’ve know Linda several years, since our early days among the vines with the TV Winegrowers Association. Today, she serves as the Media Director for the beautiful Thornton Winery. My mission was to meet Winemaker Don Reha (Ree-ah), tour the winery cellars, taste new releases, and dine with the father and son owners, John and Steve Thornton at their Café Champagne. I know, it was an arduous task. However, I was up for the job!With over 20 wineries now calling TV home, I’ve always considered Thornton Winery to be of the most inviting. Its elegant French-style chateau overlooks the vineyards and is easily recognized on the south side of Rancho California Road as you enter wine country. The winery, which originally opened in 1988 as “Culbertson”, continues its present-day operation utilizing traditional techniques and modern equipment - to reach perfection with their blends of Méthode Champenoise Sparkling wines. In 1993, the winery began producing non-sparkling, premium wines and their effort has earned many awards and medals for winemaking excellence. Over the past 20 years, the Thornton family (Sally, John and Steve), have increased their business and added unique premium varietals which emulate classic wine styles of Europe’s Mediterranean and Rhône regions. The winery produces approximately 20,000 cases annually with 50% devoted to sparkling wines including vintage Brut Reserve, Brut Reserve Natural, and non-vintage Brut, Blanc de Noir, Cuvee Rouge, Cuvee de Frontignan and sparkling Muscat. The balance of the production includes vintage whites; Chardonnay, Sauvignon Blanc, Viognier and Moscato. Reds; Estate Syrah, Sangiovese, Zinfandel, Cabernet Sauvignon, Merlot and special blends of these two Bordeaux varietals, plus the well-know Italian varietal Nebbiolo and a super tasty Late Harvest Zinfandel. I found the 2005 Estate Syrah much to my liking. More on this one later!Our tour began in the bottling area where Winemaker Don Reha described the extensive “hands-on” process of fine sparkling wine production. Reha, from Renwood California, was raised on his family’s vineyards. 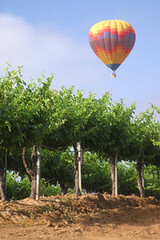 He joined the Thornton team in 2003, replacing Jon McPherson, who moved to South Coast Winery. Reha was educated at UC Davis and worked for Fetzer Vineyards, Cline Cellars, and Renwood Winery in Amador County where he served as Director of Winemaking. I asked Reha about his philosophy on premium winegrowing and production – whether sparkling or still? “I prefer working with the grapes of our valley. I have been most passionate about Zinfandel, Rhone and Italian varietals, however, we do not limit ourselves here at Thornton. My philosophy is that each wine must reflect distinct varietal expression. No two varietals should be produced in the same manner or style. Each step in the vineyard and in the winery is most important. We seek to extract the highest quality and uniqueness of each specific wine," stated Reha. The 24th Annual Temecula Valley Balloon and Wine Festival will be held on Friday, Saturday and Sunday, June 1st, 2nd and 3rd, 2007 at Lake Skinner......Lake Skinner is a Riverside County Park and is located at the southern end of the Winchester Valley.....There is an admission fee to the Festival which includes the entertainment but not food or beverages.....For a family of 4 expect to pay about $500.00 for the festival and the Balloon rides. 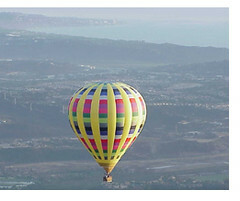 But the Hot Air Balloon ride is well worth the experience, if you are not afraid of heights.....they try to maintain a height of about 1500 feet as they sail along over the beautiful country side of the Temecula valley, Murrieta, and Wildamar....they have been known to fly as far as Perris or even Sun City, which causes quite a stir among the senior citizens of the area.....The flight I took several years ago lifted off about one hour before sunset and they set down just as the sun set, more or less timing there set down as the sun set.....During the festival they usually do morning flights.....Takes lots of sun screen, you might need it in the 100 degree heat of the day that is normal during this time of the year. The Big Horse Feed and Mercantile is a great place for kids and grownups alike. The highlight of the Big Horse Feed and Mercantile October Maze Crazy is a giant (8 acres!) cornfield maze. Be sure to bring plenty of water, and be prepared to spend at least one hour to find your way out - this thing is huge!